Our youngest niece, "A" is coming 20 months soon. She has grown quite a bit... not fat and chubby but in her height and her development. Amongst our 3 nieces, she is probably the easiest with feeding - eats almost everything, no known allergies and generally eats well. Hmm, except when she is over at our place, she'd insist of sitting on my lap while I feed her. With the yummy and healthy food she's eaten, it is no wonder that she is growing well and tall (that is partly in her genes with a tall daddy). In the past month, hubby brought her swimming in the pool in our complex. Other than her mum, hubby was probably the first person who brings her into the water. Usually, she is not too willing to be carried or interact with hubby (her 大舅). She would cry/whinge in protest whenever hubby attempts to carry her. However she would hug and kiss him goodbye when we part. 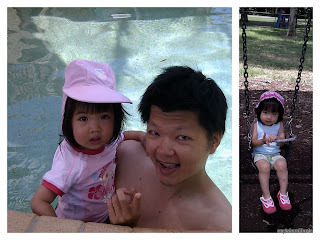 Hence, it was quite a little milestone for hubby to carry her into the pool to swim. We started out by getting hubby to carry her and/or hold her hand as we walk to the pool. She whinged a little but was okay quite soon after. She likes swimming and was excited to enter the pool. However, when we got to the pool, she seemed to have second thoughts and wanted out. After a bit of coaxing and assurance, she finally was able to enjoy the dip. I don't blame her for being a bit cautious and scared since it has been her mummy who brings her into the pool for a dip. I am glad she enjoyed it after all... but I had some trouble bathing her (crying in protest and refusing to be bathed) after the swim. "A" loves the swing in the playground. She is rather cautious with other play things in the playground but with the swing, she almost has no qualms about getting on. The swing at playground we went to, its safety chain (to secure the child) was broken. But she was careful about it. I pushed just a little for her to enjoy some swinging motion and watching to make sure that she does not fall out of the seat. I think she was happy. She'd know when to say "come down", meaning she's had enough.